The perfect holiday centerpiece could be just minutes away. If you're looking for a Christmas centerpiece craft to do alone or with your family, it can be as simple or as complicated as you desire. From putting items in a fancy bowl to arranging flowers, it's up to you. Christmas centerpiece crafts can be as simple as a pretty glass bowl and some ornaments. It's easy, it's quick, and it's festive! It takes five minutes of your time and brightens up your table almost effortlessly-and without breaking the bank. All it takes is a trip to the store for ornaments in your choice of color scheme. Some people will choose red and green only, but silver and gold, silver and purple, and multi-colored schemes can dress up your table and complement your pre-existing colors. Mix up the colors and sizes within the jar, the vase, or the bowl for the most pleasing appearance. In the fruitcake spirit, you can also fill a glass bowl with colorful fruits. Your table can look like something straight from a famous still life painting. Put the bowl on a red placemat or other small red cloth. Want to stick with Christmas colors? Instead of choosing apples, oranges, bananas, and grapes, just go with red and green apples. For a more rustic touch, try pine cones in a pretty bowl wrapped with red felt ribbon. Candles are an easy and elegant centerpiece. You can take a silver serving tray or a simple mirror and set up candles of different sizes-all the same color, within a small color scheme, or multi-colored-on top. They'll sparkle on their own, but with the light glinting from the silver tray or mirror, they'll be even more festive! For another holiday touch, add bows to the bottoms. Feeling adventurous? 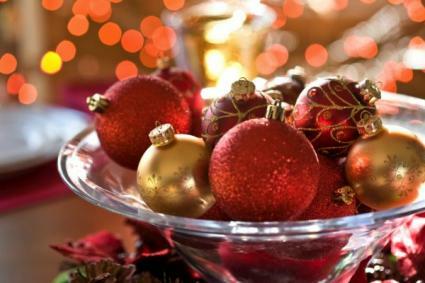 You can create more complicated Christmas centerpiece crafts that take more time and skill than the ones listed above. This one's not complicated, and it comes from Craft Central Station. Basically, take a Styrofoam ring, pin some candy to it using pins through the bottom until it's covered, set it on a dinner plate, and put a few red and green candles in the middle. This is the perfect level of difficulty to make during a family crafting hour with your kids. Craft Town has a centerpiece featuring a sled and a Christmas tree. It'll take paint, glitter, ribbon, pom-poms, and more, so your shopping list will be on the long side. It's worth it, though, for this incredibly festive tabletop decoration. If you're having a large Christmas party where your guests will be sitting at round tables, one of these on each table would be perfect. You can even create different themes within each tree-based on the color or the topper. Make Stuff has a fun new spin on potted poinsettias. It's a "floral arrangement" made of candy. It's even set up in a flowerpot decorated for the season. Pick your favorite types of candy to feature. The fun thing about this one is the ability to revamp it for other holidays and occasions. If floral arrangements are your thing, don't hesitate to put together something marvelous using poinsettias. You could add in a few silver or gold accent pieces for extra festivity and an opportunity to catch more light. For an upscale, classy feel: Metallics are in when it comes to Christmas decorations. They're an immediate way to add a touch of class to any setup. The key to using them is to either pair them together, as with gold and silver balls, or to pair them with a single color, like silver and purple. Keeping it simple keeps your décor looking grand. For that old country cottage look: If you want to revisit the good old days when you were a kid riding around (or walking) to check out the neighborhood light displays, you'll love using multi-colored splashes for your centerpiece. If you have kids, they'll love this kind most.